Wow! That’s been a while since I posted here! A bit of vacation, Christmas time, and New Years Eve, they have all been kind of ‘in the way’. Time for family, friends, and a bit of rest. A good time! I’m wishing you all a very very happy new year, with lots of health! May it be a blessed one! But……, I have not been sitting still! I’ve been preparing on new video’s. Trying to figure out the best way to do crochet borders. Yes, I know, I already have a video on that subject (see here), but there were some things that always kind of bothered me. And you know, yarn is forgiving, so usually things just work out fine, but I really had the wish to figure it out for once and for all, how to do it in the best possible way. Well, I found a way that I was very pleased with myself, and I made some video’s about that. They will be published in a short while. Another video I made is about doing triangles on a square loom. I had been trying some things out, and I found a way to do that too. I already have the tutorial on my tutorial pages (see here), but the video is now made too. So, that will come also in a short while. 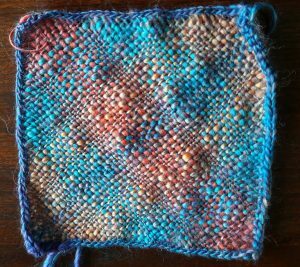 And, I tried out working with a medium sized yarn some while ago. It really was so lovely how that turned out! I already had a picture of it on this website and on the thumbnails of my video’s, so maybe you noticed it already. Okay, it also had a lot to do with the yarn of course, but I made a video with some explaining about that too. I really have to do a video on how to attach pieces together! Both for pieces with a crochet border and pieces without it. But I’m preparing on that too. 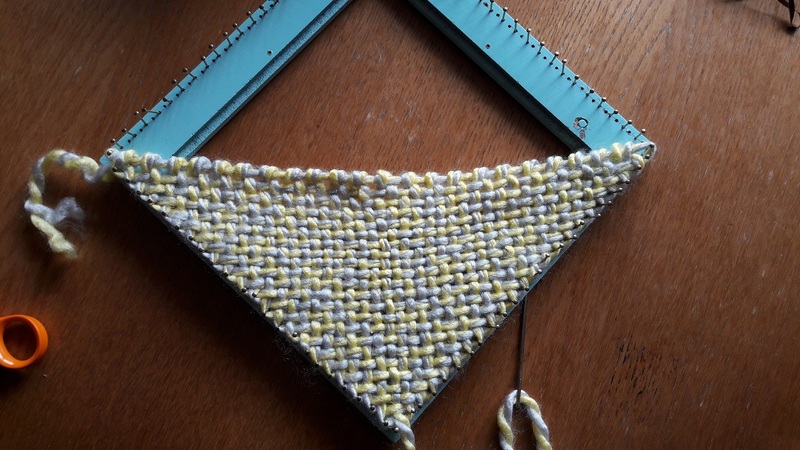 Yes, of course there is information on the internet about that too, but, like with what I told about the crochet borders, I’m trying to think of the best way to do that. Do it just a little bit different. Or, at least figure out how to teach and show you this in the best possible way! Maybe doing some other experiments with my loom. Other ways of weaving on it. That is also what is on my mind. But, I think I will first do some video’s on weaving on a Zoom Loom. I have been working on that also in the last year, and I made samples, so I really would love to do that also. Well, there is a lot more on my mind actually. ‘Regular’ weaving video’s about working with a rigid heddle loom, weaving on my 8-shaft loom, card weaving, inkle loom weaving, crochet, knitting, picking up my tatting again, more knotting video’s. There is so much I would like to share with you. But I have to pick and prioritize. It’s good however to have lots of ideas. I also had another video lying on the shelf, that I shot earlier. And this is what I really wanted to publish first! And that is about working with finer, or thinner, yarns. As you know of my instruction video’s, I worked with a yarn that actually was too thin to work with on my loom. Well, it was for demonstration purposes only, so that’s okay. 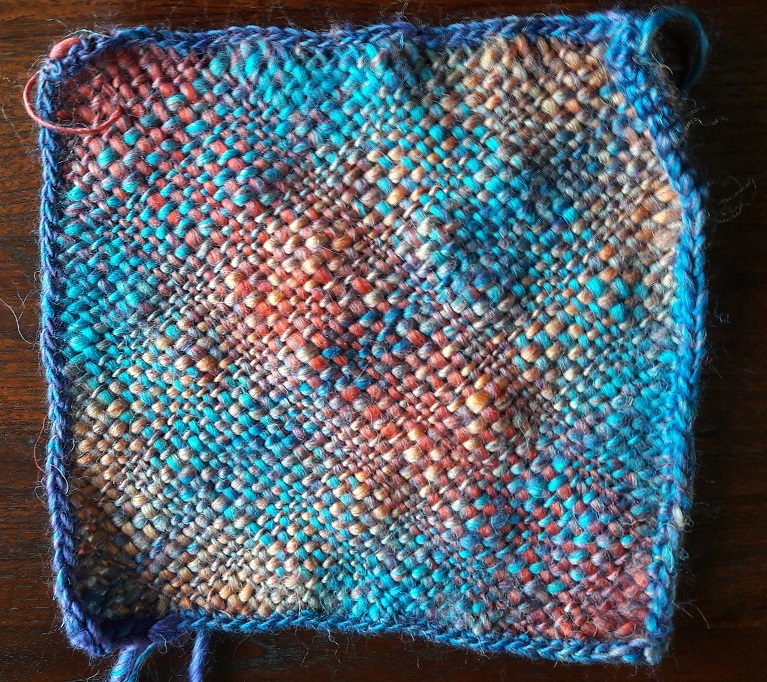 But, what to do when you have a lovely yarn, that you really really REALLY would like to use on your weaving frame, but makes a way too open weave structure. Well, here is the solution to your problem! Because you can use it! I split the video in 2 parts, because it was quite long, so wait a little bit for part 2. 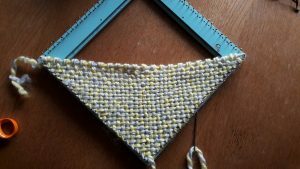 It’s about how you do a crochet border around this, because it needs a little ‘trick’. 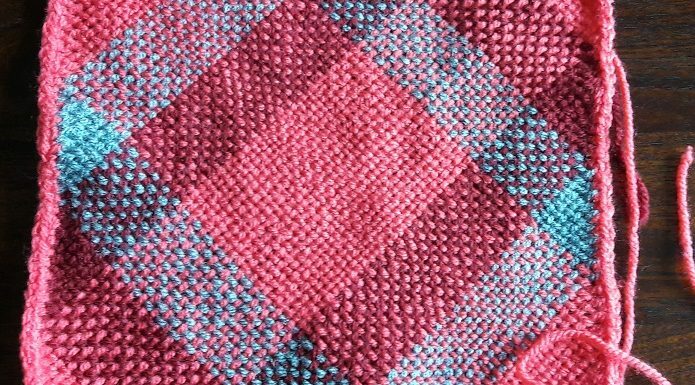 But of course you can also just take it off the loom without a crochet border. That’s okay also. I hope you enjoy this video again, and please leave some comments and give it a ‘thumbs up’ if you do like it, and subscribe to my channel to be informed about new video’s!